We've brought together advisors who were everything from top performers at top technology companies like Facebook to influential early employees at companies that are now worth billions in value like GitHub. Together we have experience hiring hundreds of students, and experience mentoring and helping even more. Rachelle was the first recruiter at GitHub and helped scale GitHub up from its early stages in 2013. Before GitHub, Rachelle ran university programs for Google recruiting and after GitHub, Rachelle went on a "tour of duty" recruiting technical talent for the U.S. Digital Service at The White House. She uses her expertise and network in technical recruiting to help fellows find, network, and negotiate their ways into their dream positions. Murat was Software Engineer at Microsoft for over 4 years building various platforms/technologies that changed the modern web such as Chakra, Typescript and Apache Cordova. After serving briefly on the Apache project management committee, Murat co-founded Codela, a venture-backed startup that restructured the way companies think about software engineering interviews. Murat works closely with Pathrise fellows on topics ranging from software engineering, web development, and startups. Bryce was a product designer at Airbnb for 2 years where he became a “Swiss Army Knife” working both in the marketing-side with the Art Department, and product-side with Airbnb Experiences. Before that, he co-founded Nubko, a creative collaboration startup. He also worked as a graphic designer for a handful of clients, including celebrity chef Guy Fieri. Drawing from all the portfolio reviews, designer case studies, and design projects that he's worked on and given out from both sides of the table, Bryce helps students enter into the still-developing world of design. Brian was a senior software engineer for Zazzle, one of the largest product customization marketplaces in the world. There he led several features on the mobile team. Before Zazzle, Brian was a software engineer at CBS and founded a company called Spondevu. Now, Brian works directly with Pathrise fellows on technical interview preparation and how to find the best possible job in the field of software engineering. Imani was a UX design immersive instructor at General Assembly, where she delivered over 800 hours of in-classroom instruction and one-on-one mentoring. Before that, she worked on the core product experience at a shoppable video startup called Darby, while also serving as a design consultant to small businesses. A career changer from the field of nonprofit communications and fundraising, Imani helps emerging designers tap into their storytelling power. Jared has taught computer science, statistics, math and physics to hundreds of people and received rave reviews from students while doing so. He currently runs a local Noisebridge Python class that aims to make programming available to everyone. At Pathrise Jared helps fellows practice programming and data science so that they can ace their interviews and continue on to satisfying careers. 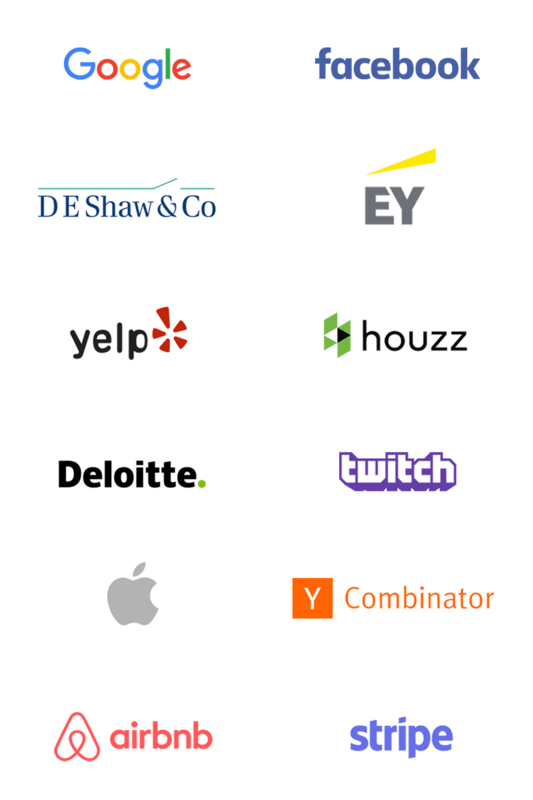 From household names to emerging startups, our total network includes 110+ companies.